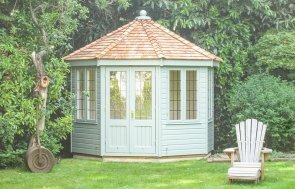 This traditional Wiveton Summerhouse in Thatcham, Berkshire is the final touch of perfection for our customer’s beautiful garden. The complimentary combination of the Pebble coloured exterior timber coating with Ivory leaded windows and doors gives this Summerhouse a traditional look and feel. The exterior timber is protected using the Valtti paint system. This is the best possible protection for exterior timber, it is opaque, extremely durable and low maintenance. Our customer decided to have Cedar Shingles roofing installed on their Wiveton Summerhouse. 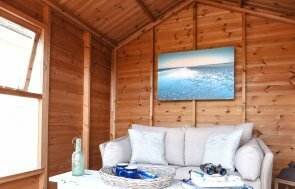 For the interior, the customer designed her garden building with additional underfloor insulation, painted matchboard lining and wall and roof insulation. As well as this, she opted for an electrical pack so the building can be used all year round. Each of our garden buildings are built at our Norfolk factory HQ near Swaffham using slow-growing FSC® certified timber sourced from our partner sawmill Northern Sweden. Find out more about how and where we source our timber in our related article: Where We Get Our Timber. If you have any queries about your own garden building, please contact us, request a callback or call us on 01760 444229 and one of our friendly team will be more than happy to talk through your requirements with you.